PARKING: From route 3 in Groveton turn onto route 110. Turn left onto Emerson road. Continue on Emerson Rd bearing right at the Y to the end. Turn Left onto the gravel Nash Stream Rd and follow it 8.1 miles to the Mt. Sugarloaf Trailhead. There is a obscured "Sugarloaf Mountain Trail" sign mounted to a tree. There is parking for 2-3 cars in the small lot and roadside parking. 2 hours 45 minutes from Manchester. DESCRIPTION: From parking follow the Mt. Sugarloaf Trail past the cabin and around the gate through the grassy field. The lower section of trail appears to also be a snowmobile corridor, former carriage road or both. You soon reach a trail junction with a sign to the "Old Hermit Cabin" bearing left which heads to Sugarloaf Arm. Bear right continuing on the wide Sugarloaf Mountain Trail. As you ascend you soon reach a snowmobile trail junction (left). Continue straight across this junction taking the upwards path. The carriage road has poor drainage and extremely muddy and buggy on it's lower sections. The relentless trail begins along a moderate grade soon becoming steep after a set of small cairns on the right side of the trail. After about 1.75 miles and 45 minutes of strenuous hiking you encounter a grassy field and the remains of an abandoned cabin. Pass the cabin and bear right into the boreal forest as the incline finally begins to slightly level off making the final pitch to the summit. The obvious summit is mostly open providing great views to the nearby Percy Peaks, North Country and Northern Presidential Mountains. There is a sign, benchmark disk as well as two rods marking the summit. The Sugarloaf Trailhead is disguised as a campsite and very obscure. 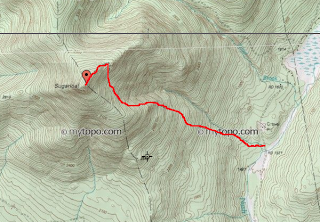 Pay attention to your mileage on Nash Stream Rd and the small Sugarloaf Mtn. Trail sign can be easily missed due to the overgrowth. The trail is poorly maintained and if not for the wide carriage road would be challenging to follow. I was excited to reach the former cabin site however my excitement transitioned to disappointment when reaching the cabin to find just a pile of building materials strewn about and no recognizable cabin. The intermediate grade trail gets steep after this cairn.